Tagged under Samurai, Occupations, Japanese Terms. The Shinsengumi (translated as "Newly Selected Corps") were a feared police force of the late shogunate period, also known as the "Wolves of Mibu". As it was one of the more famous, interesting and remarkable parts of Japanese history, the Shinsengumi are often noted in anime as a reference or as a basis for the storyline. 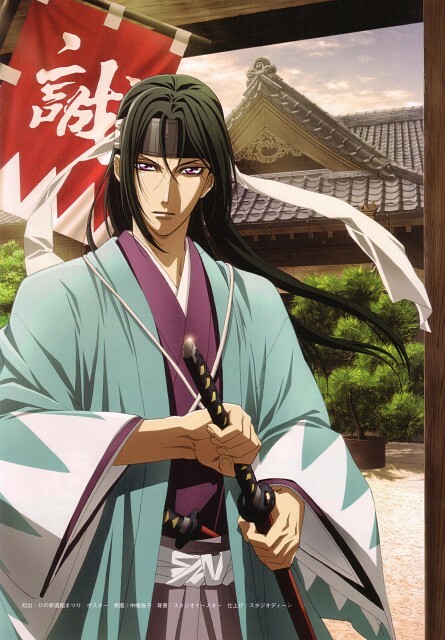 Peace Maker Kurogane, Hakuoki Shinsengumi Kitan, and Rurouni Kenshin are some examples. To be used for characters who ARE members of the Shinsengumi or are wearing the uniform of the Shinsengumi. The most common uniform is a light blue haori with white triangles ("White Mountain Stripes") tied with a white cord. Do not use this tag if the characters are in contemporary clothing.